Blog | 1st Binfield Scouts | Welcome to our adventure! Well done to all the performers who appeared in this years Gang Show. 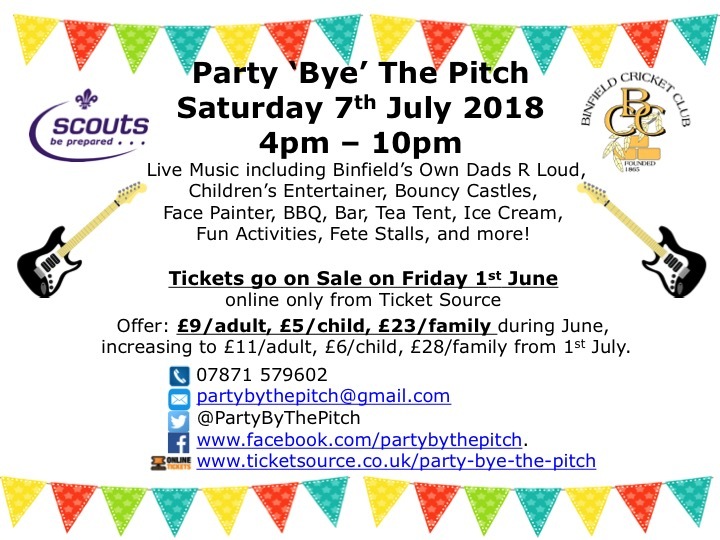 1st Binfield had 5 members up on stage for this years performance: Raul, Richard, Harry, Kai and Max and they were accompanied by some great Pirate performers from the Beavers section (leaders included). This years show was a special one as Shirley the producer for many years was stepping down from her role. All the performers up on stage did her proud and the send off was emotional. If anyone would like to know more about joining the gang show for next year please speak to any of the leaders. A big well done to all the Scouts and Leaders who took part during this weekends Ridgeway Ride which saw the Scouts complete a 26 Mile cycle ride over 2 days. The weather was good all weekend so no major disasters. The Scouts completed the expedition in good time and they all thoroughly enjoyed the experience. Thanks must also go out to the Support team who helped along the way. On 20th / 22nd June the scout sessions will comprise a cycle ride around the village. Thus scouts will need to bring their own bicycles and preferably bicycles with gears as the route will include hills as well as off-road cycling. The session will be at the usual time, 7:30 to 9:00 from the hut. In addition each scout MUST have a helmet. No helmet no ride. Please can you complete the form below since this is an outdoor activity and return on the evening of the cycle ride. Also – we need parent helpers on both the Monday and Wednesday evenings to assist the Scouts in case of issues. If any parents can assist please let Alan Phillips know by 13th June. The cubs will be heading off to Chalfont Heights this weekend. Hopefully the weather holds as there are loads planned. The scouts are now settled in at Longridge for this years camp. Fun and games have been arranged by the river. Well done to all those involved in Scout Camp this year. Even though the weather wasn’t too great they all had fun with all the planned activities as put on by Longridge and the Scout Leaders. Scouts have now broken up for the Summer Holiday break and we’re due back on the 14th September. Keep an eye on emails for further information. Wow Beavers at 1st Binfield is now 10 Years old. 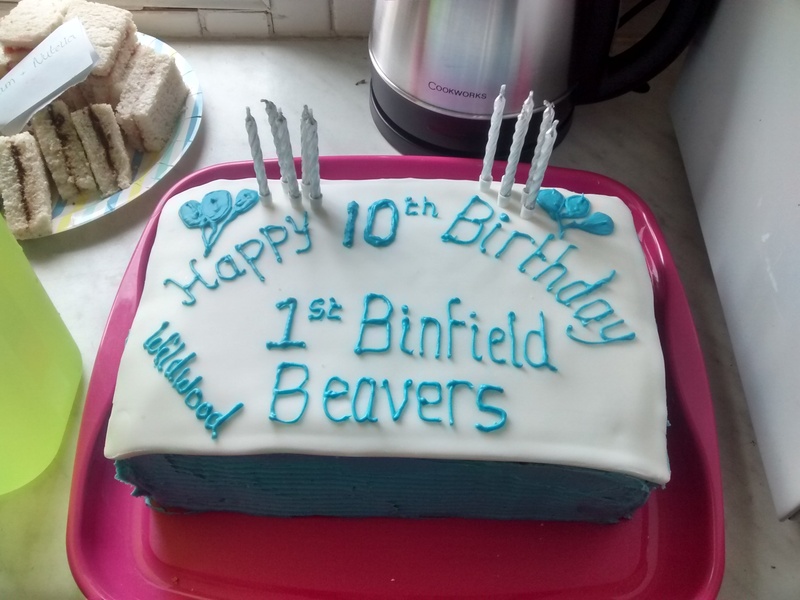 Happy Birthday and well done to all those who have been involved in any form at Beavers whether you were a Beaver or a Leader. The Beavers celebrated by having a party this week and invited guest from the past to come along and join in the fun. Food, Drink and party games what more could you ask for from a party. Well done and here’s to the next 10 Years!!. Well done to all those involved in the District Challenge this year. You managed to bag the trophy again second time on the trot for 1st Binfield. A great achievement and effort and worthy winners.